If you need some flash game diversion on this fine Tuesday, consider joining CrappyCat on his strange voyage into another dimension. CrappyCat is both a cool toy and an interactive adventurer: Fueled by alcohol, he fights penguins, humps robots, plays ping pong with monsters, eats living ice cream, and eventually is defeated by a monster who sticks his tongue into his own nostrils, pulls out one of his eyeballs, and throws it at CrappyCat. At which point the eyeball, of course, explodes. 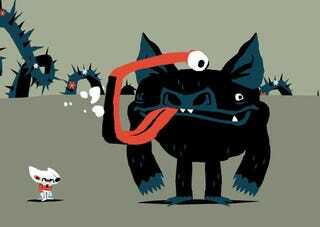 Beware the eyeball nostril bomb monster! But how does Darth Vader fit into all this? Join CrappyCat in his abnormal journey to the bottom of a bottle and into another dimension. Part of this abnormal journey involves fighting multiple Darths who swing out of the sky. I love the way the art in this game looks like a cross between Kid Robot and Mike "Hellboy" Mignola. The piles of skulls are lovely, as are all the interactive monsters.